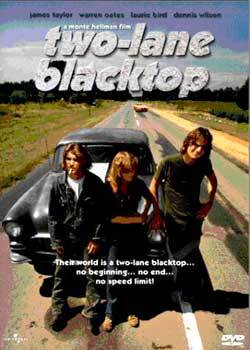 Monte Hellman’s “Two-Lane Blacktop” is primitive, yet brilliantly structured cinema with no character development or plot to speak of. It has simply been stripped of everything that one thinks they need to bolster a movie experience. What it is, essentially, is a piece of moving art that is a road picture in the purest sense. The main focus is on the cars and the road, with some interesting Cliffs Notes in the rock ‘n’ roll world. The first thing you may notice is that none of the characters have names, an element often needed in a movie, and here, the three main characters are credited as the Driver, the Mechanic and the Girl. That can attributed to Rudy Wurlitzer’s movingly poetic script, which strips the picture down to bare essentials. Wurlitzer not only removes the names of characters, but the concept of events enhancing the plot, and then the antagonist of the piece G.T.O. (The name of the character’s car) is not even a villain in the strictest sense of the word. Some might be left wondering, what is the point, but how often has a road picture taken the time to focus on cars and the open road? The audience is allowed to take a seat with the main characters for a vividly real drive through America. Hellman uses the camera as a paintbrush to interpret his love for the country, allowing each shot and the beautiful authentic scenery to tell you all the information that you need to know. This is what “Easy Rider” could have been if the direction of it was handled better. The actors chosen are as unique as the structure of the plot, and features an early film appearance of James Taylor as the driver. Taylor is a bit uneasy making the transition from music to film, but in a sense that works for the character. We don’t know anything about this man or his past, and that allows the uneasiness to be overlooked. It would have been great had Taylor continued to mold himself as an actor, because the man shows signs of potential. The complete opposite can be said of his co-star, the late Beach Boys drummer Dennis Wilson, and that is because he has a natural onscreen presence. It seemed that everything Wilson touched turned to gold, and with minimal dialogue he manages to draw the audience to his character. He plays a strong and silent mechanic that travels with the Driver on this journey. Along for the ride is the Girl, played by the late Laurie Bird, who was a mediocre actress and a character the script could have done without. But Bird serves as an important footnote in the history of Art Garfunkel, because she committed suicide on June 15, 1979 in his apartment in Manhattan. This all makes the movie more significant in the rock world than in the history of the cinema. The picture is centered around a cross country drag race with G.T.O., who is played wonderfully by the legendary Warren Oates. Oates even has a majority of the dialogue throughout, as he rambles with every hitchhiker that he picks up. He was one of the best character actors on-screen, who always added more dimension to some classic pictures. Once you see Oates’ face on the screen, you can’t help but feel that you are in good company, and that is why he is simply a legend at what he did for a living. One more interesting side note is that on the soundtrack, you can “Me and Bobby McGee” sung by Kris Kristofferson, the writer of the song. It is a nice soft spoken country version of that classic hard-rock song, making it impossible to compare the two. “Two-Lane Blacktop” is a moving and powerful journey through experimental film making, which provides a reminder of what movies could be. It also makes you want to get a camera and try to film the open road yourself, and that is exactly what Hellman wanted from his audience.